These are probably my favorite things to make on wallpapers, or just about anything for that matter. This one takes some getting used to, but I guess most things do. Keep in mind too that you can use these shapes to cut out other things as well. Like if you want to cut out a tribal shape in a circle, or whatever. Playing with all sorts of combinations will help you get better at this. First click the pen tool, BTW if your "tools" bar isn't open just goto the "windows" menu and then pick "tools." Now on your canvas you can either click and you'll make a dot, or you can hold down the left mouse button and you get a weird blue line with 3 dots on it. The center of that line is where the real line will start and the other two dots is how you make your angle. It's kinda tough to explain so just play with it. Anyway, once you've picked the angle you want make another one and they'll be connected. The shape it makes depends on whether you did the one dot or the angle line. Now to make a "tribal." Pretty much, you just keep making those angled lines to get all sorts of curves. And, the great thing about this, if you don't like how the shape turned out, just use the white arrow (top right botom on tools) and select the angled line you want to change and you can move it, you can also pick the outter dots and move those around to change the angle and length of the line. Here's a crude example of take a basic shape of what you want and editing it to something nicer. That's pretty much it, just practice and have fun. 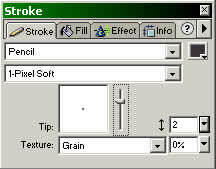 Also to change the line width, color etc, goto the stroke menu under "windows" - "stroke." The first option you get on there is how the line looks, I usually you "pencil" with "1-pixel soft" for the second option. The box on the right of that is for color. You can change how "soft" the tip is with the "tip" box, as well has it's width in the little box next to that. And the texture is just that, you can give a line a texture if you want. Also under the same menu is the fill and effects tabs. Play with those as well to get all sort's of options.